You’ll need to pray that luck is on your side. Respawn Entertainment seems to hide a lot of exclusive and rare items for players to find in Apex Legends. One of these items is Wraith’s Kunai knife, a fabulous-looking melee item that any Wraith main will surely want to get their hands on. But how exactly do you find it? And where do you need to look? Well, the answer to those questions might not be what you want to hear. The only way to get the knife, alongside other items in the set known as “Heirlooms,” is in the loot boxes, which are called Apex Packs. These Heirloom items are incredibly rare and hard to come across, with some media outlets quoting the odds of getting one at 500 to one. If you’re lucky enough to find an Heirloom set, you’ll also get a pose and voice quip for Wraith at the same time as the knife. It seems like there are more Heirloom items hidden in the loot box system, but fans still need to find them first. 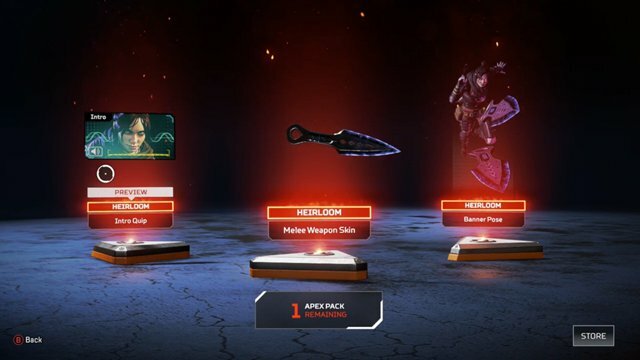 As such, there’s no guaranteed way to get Wraith’s knife—even if you continuously fork over cash to EA in hopes that one drops when you open Apex Packs.